View from above of the tube opening with a binocular microscope. Notice how the grains of sand are arranged. On the top part of the photo, a worm is spreading out its tentacular filaments into the water column. Honeycomb worms build tubes from sand or shell fragments, which protect them from predators and which they never leave. The worms can rebuild the entrance to their tubes quite easily. However, if the tubes are broken off too far down, the worms are then exposed and defenseless and will perish. The size of the grains of sand which make up the tube are variable and generally depend on what is made available to the organism by current transport. Individual worms are also capable of selecting grains depending on their shape and nature: small shell fragments are particularly appreciated. The selected grains are then stuck together with a special glue (cement) secreted by the worm: it is capable of strategically placing a few dabs of glue around the grains in order to give its tube maximum solidity. The latter is made up of several overlapping layers, much like the tiles on the roof of a house, which are laid down on a sheath secreted by the worms body which gives support to the innermost layer. 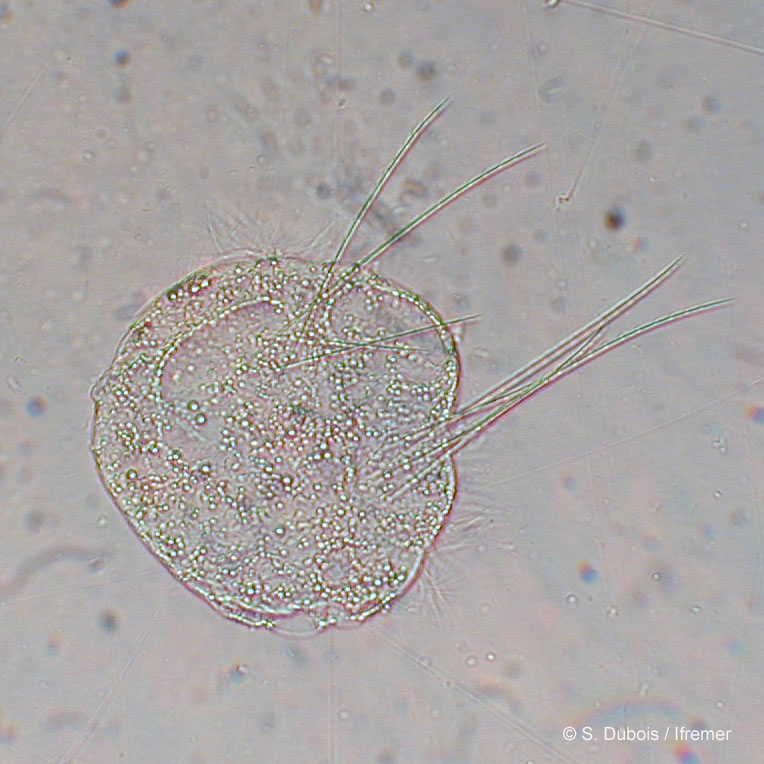 The first larval stage seen under the microscope (magnified 300 times). 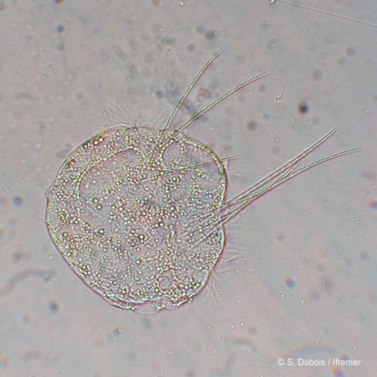 Notice the presence of long chaetae and small bristles along the body. Sabellaria alveolata is a species with separate sexes. When the worms are mature, the abdomen of the ripe males appears ripe, and that of a female, bright pink or violet, because of the colour of the sperm and eggs respectively. On our coasts there are two spawning periods in the year: the first occurs in April-May and is the most important, and the second smaller spawning event is in September-October. 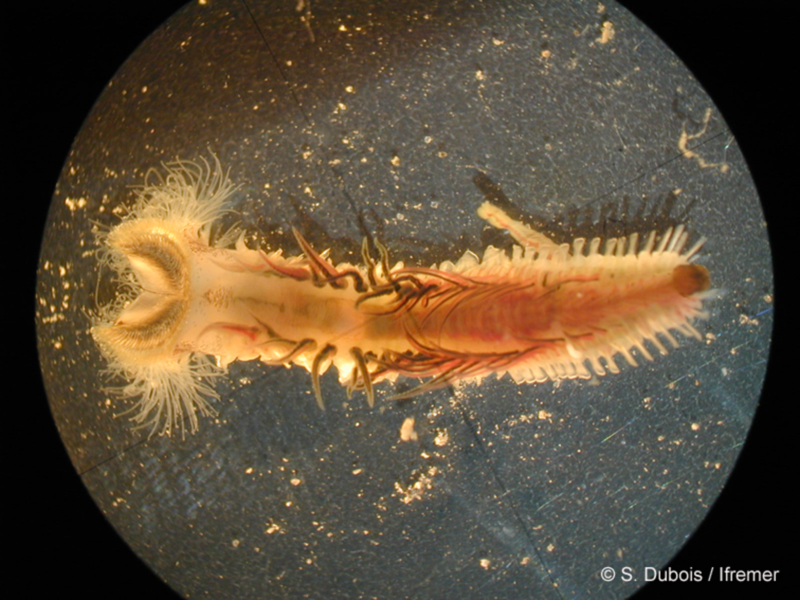 This species has a bentho-pelagic life cycle, which means the adults live attached to the seafloor whereas the larvae develop in the water column. In their first development stage the larvae measure 80 µm, and will continue to grow for approximately 5 weeks until they reach 1mm in size and are ready to metamorphose. They can then attach themselves to the substrate and build their first tube. During these 5 weeks of pelagic life in the water column, the larvae are transported by water currents over sometimes great distances, but once they are ready to settle, the larvae - which are very poor swimmers - need to quickly find a suitable substrate which they can populate. Adult tubes, thanks to their organic cement, contain a substance which the larvae detect and which tells them that they are near a very favourable substrate, namely an existing reef. 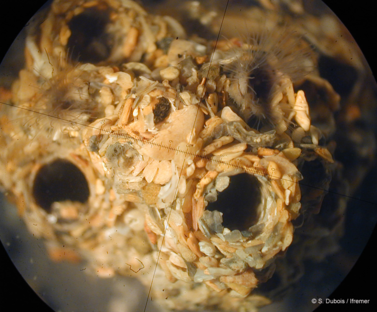 Honeycomb worms are filter feeders: their head is equipped with special feeding processes that collect detritus and plankton from the surrounding water. At low tide, the worm is in the lower part of its tube, which is closed with a silt plug to prevent it from dessication. As soon as the tide rises and the water returns, the worm crawls back up its tube and extends its tentacular filaments into the water. Each worm possessed several dozen tentacles which are inserted ventrally near the head and are covered with microscopic cilia, allowing food particles to be captured and conveyed to the mouth. Once in the buccal cavity, particles are sorted and filtered by two buccal palps. Aggregated particles of pseudofaeces are expelled by the animal out of the tube entrance, as are the faeces, which are evacuated by the caudal appendix that is folded back along the worm's body. These tentacles create a filter which is capable of sieving particles as small as 5µm. The honeycomb worm diet is mostly made up of planktonic microalgae and small plant debris suspended by wave action. Dorsal view of a specimen under the binocular microscope. The head is on the left. Notice the U-shaped opercular crown which protects the animal in its tube by acting as a lid, and the tentacular filaments protruding from the ventral side. The red and green appendages on the body are the branchiae. Towards the posterior end (to the right), the whitish protuberances are the parapods. The caudal appendix which doubles back along the ventral side of the body is also visible.